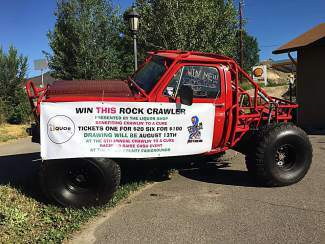 You could win this Rock Crawler by entering a raffle presented by The Liquor Shop In Gypsum. The proceeds will support Crawlin' to a Cure, a local nonprofit that offers the Tiffany Myers Memorial Keepin' Em Real Scholarship and helps families impacted by cancer. Tickets are one for $20 or six for $100 and can be purchased at The Liquor Shop. The drawing will take place Aug. 13 during the sixth annual Racin' to Raise Cash event at the Eagle County Fairgrounds.